Art is an integral part of connecting people to community and culture. With this strong belief in mind, First Nations Development Institute (First Nations) launched the Native Arts Capacity Building Initiative (NACBI) in 2014 to significantly increase the organizational, managerial and programmatic capacity of Native organizations and tribal government art programs. NACBI, which is supported by the Margaret A. Cargill Foundation along with contributions from tribal, corporate and individual supporters, provides direct grants, technical assistance and training to Native organizations and tribal government art programs so they can continue to work with and support Native American arts and artists. 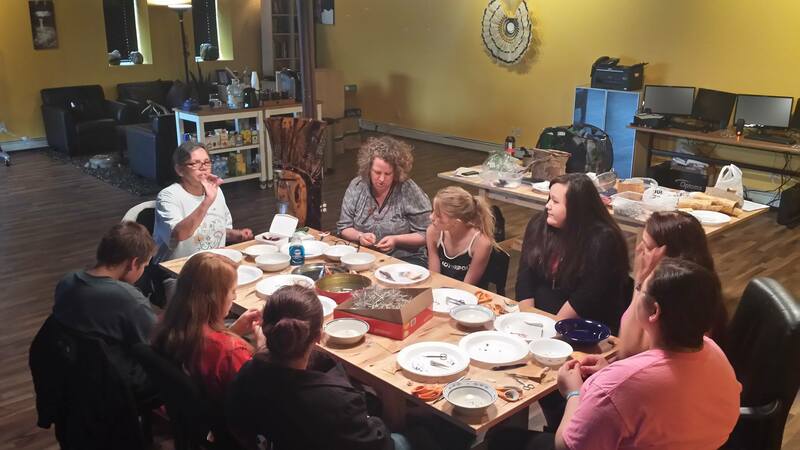 In October 2014, First Nations awarded six $30,000 grants to Native art programs in Minnesota, Wisconsin, North Dakota and South Dakota. Gizhiigin Art Place, located in Mahnomen, Minnesota, was part of the first round of grant awards through NACBI. 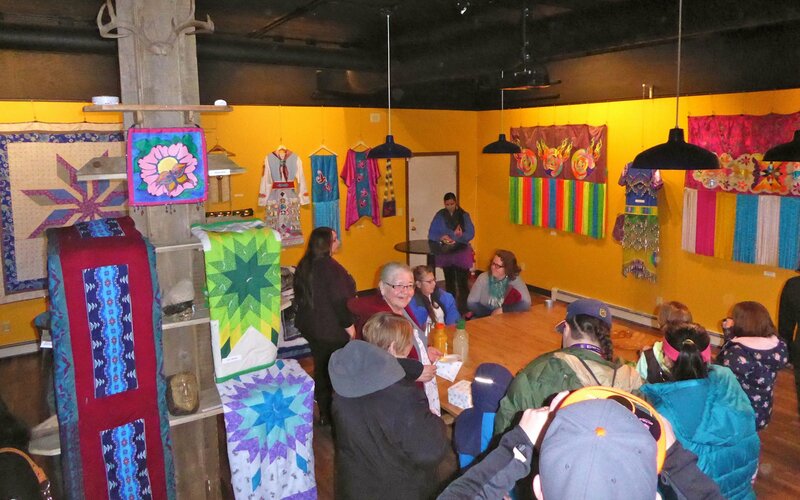 Under the umbrella of the White Earth Tribal Economic Development Office, Gizhiigin Art Place was formed with assistance from Michael Neusser, the economic development director for the White Earth Reservation Tribal Council, and in partnership with the City of Mahnomen. Gizhiigin focuses on developing the arts industry on the White Earth Reservation and supports the growth of local artists and entrepreneurs by providing business tools and resources that help them generate a sustainable income through their art. Aside from the business training Gizhiigin offers, another important component to the program is the creative labs, which expose artists to other techniques and mediums. “It’s about making art to keep their creative spirit, not about making art just to sell. We want them to think about maybe diversifying what they do and intersecting what is art and what is crafts,” said Goulet. Within the space, artists have the opportunity to mentor youth and to host workshops, trainings and events for the larger community. There’s a printmaking class, a sewing lab and a photography lab that all members of the community can access, not just Gizhiigin’s artists. With the foundational support from First Nations through the Native Arts Capacity Building Initiative, Gizhiigin is doing just that. Successfully launching its services, completing community outreach and recruiting artists during its first year of programing. It is important to remember, however, that programs like Gizhiigin Arts Place can only continue to be successful with consistent funding that will continue to create opportunities to help nurture Native artists and entrepreneurs on rural reservations. This entry was posted in Uncategorized and tagged Abi Whiteing, Chibinesiikwe, First Nations Development Institute, Gizhiigin Art Place, Joseph Allen, Karen Goulet, Lakota, Mahnomen, Margaret A. Cargill Foundation, Michael Neusser, Minnesota, NACBI, Native art, Native artists, Native Arts Capacity Building Initiative, Ojibwe, Tom Ferrarello, White Earth, White Earth Nation, White Earth Tribal and Community College by rblauvelt. Bookmark the permalink. awsome we need more of our Tribal art produced and marketed world wide. maybe our Tribal folks will become proud of who they are again?? I am a retired commercial sculptor in the toy industry (Star Wars etc.) and founding member of the Kennedy Heights Arts Center in NE Cincinnati which is now 12 years old. I have a lifelong interest in First Nations culture. I can imagine a replica pre-columbian village a little like Colonial Williamsburg where non “first people” could experience the arts and crafts and real lifestyle down to sleeping in an earth lodge or grass house and eating natural,…in essence an “Extreme!” dude ranch not for dudes at all. I would be your first customer.